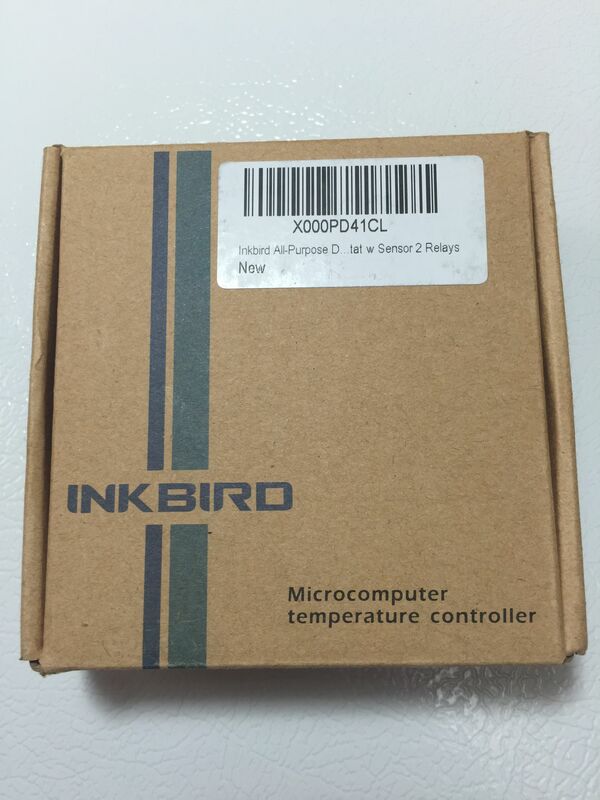 Enter the Inkbird ITC-1000… It’s 110 V, Dual Stage (can control both heating and cooling output), has an alarm to indicate sensor failure or high temperature and… it displays in Fahrenheit… finally! It’s also said to be more user friendly than the STC-1000. 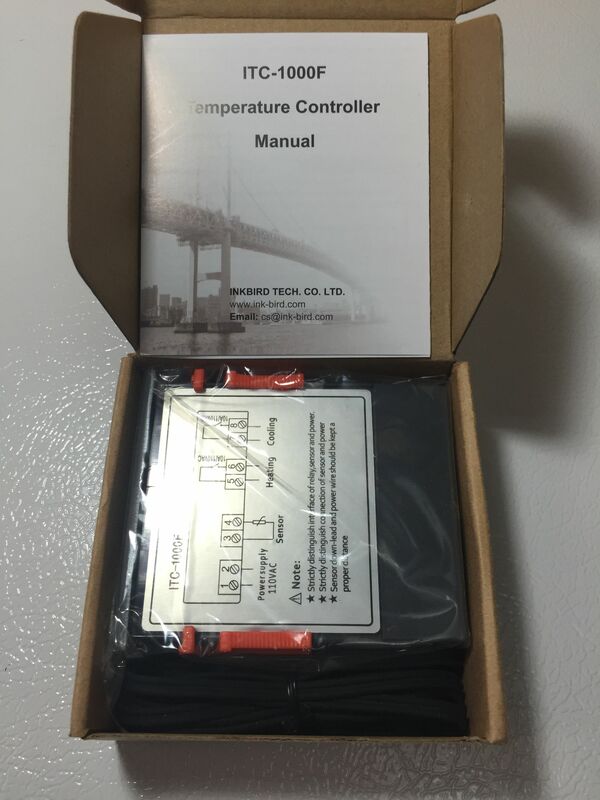 The STC-1000 was already a great controller, arguably the best value in temperature controllers. These improvements seem to make a great thing even better. Box opened. You get the dual stage controller, temperature probe and manual. The top of the controller displays a wiring diagram. Back of the controller. This removable plate partially shields the wire connections. 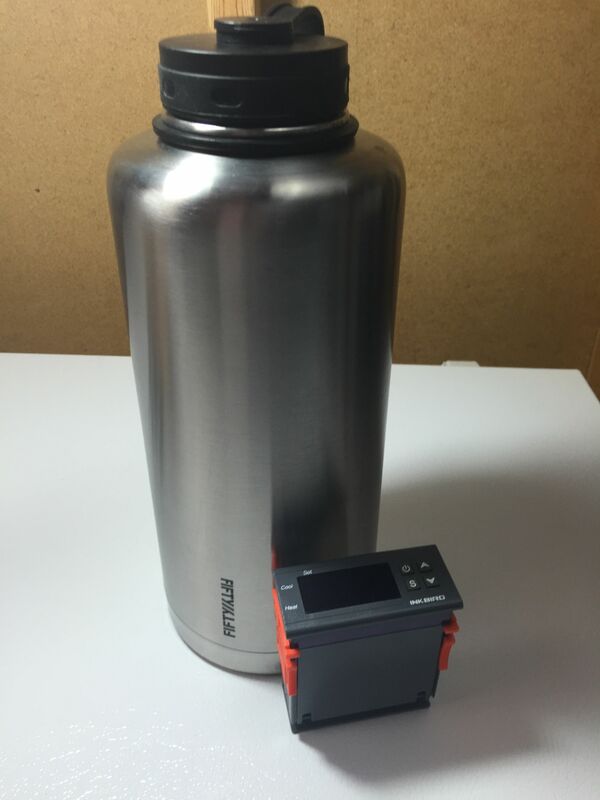 For size comparison next to the Lifeline 7508 Stainless Growler – Review. 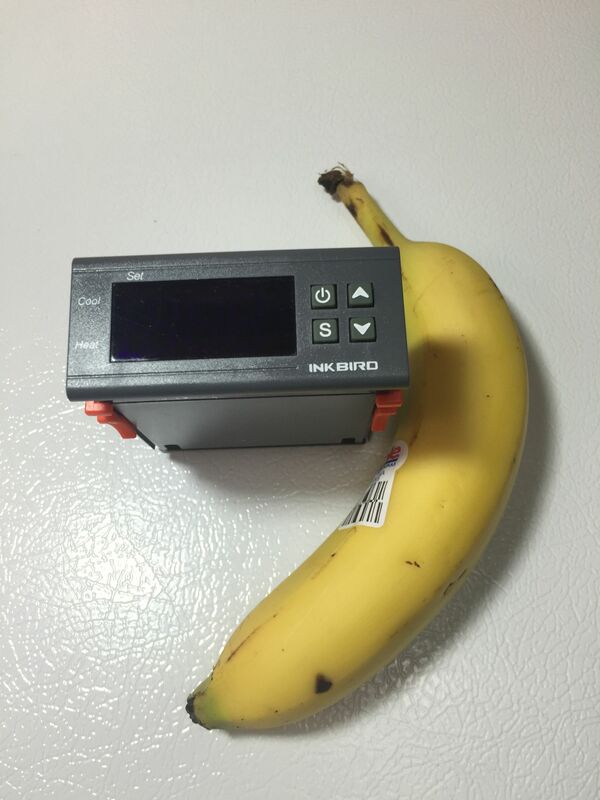 For size comparison next to… a banana. Yes, I ate this banana. It was pretty tasty. This entry was posted in Amazon, Draft, Featured Reviews, Fermentation, HBF Tested, Reviews, Reviews & Top Posts, Temp Control on February 10, 2015 by admin. What size banana is that? Great question Dan! That is what I would call a standard size banana. Is there a way to calibrate the unit. We recently had some bad thunderstorms come through & my unit starting reading higher than the actual temp of my aquarium – so the unit went into ” COOL ” mode . So I wonder if it can be calibrated – or if I should just think about replacement . We have a ITC-1000 . Could you try one 15A fuse? BTW, What are your heater’s wattage and current? Hi I put a 10 amp fuse between my heater element and the number 6 connector . I have the neutral going from connector 2 to the plug and to the other heater element wire. I have connector 1 and connector 5 and the hot wire from the plug together. It keeps blown the 10 amp fuse. I put the fuse here because I sprung a leak and shorted the other inkbird out blown the little brown box connector in the inkbird. I have pulled out my heater element and have found no leaks so I should not be shorting out the system. Why would I continue to blow the 10 amp fuse? Hey Gordon! I’ve emailed Inkbird and asked them to answer. I’m no electrical expert and I’m guessing they’ll be able to help you. Does anyone know what type of probe they are using and what replacement options could be used if need be? Can you tell me if the included probe is just for use as an ambient probe or is it submersible? I *think* (but I’m not sure) that the probe is submersible. It appears to be watertight and I believe others have indicated that the STC-1000 probe is submersible. I’ll also give that a good test when I put mine together. I’ve had an STC-1000 sensor that looks like the one pictured (black rubber) sitting in a 12oz bottle of lightly bleached water for 3.5 years now and it still works. Put electrical tape over the top so water does not evaporate. Maybe I should change the water. I have my probe in cheapskate vodka, tightly capped so it doesn’t evaporate. I switched to vodka after The Great Freeze of 2011 when I was lagering at 34F, and the water froze. Read recently that it’s a better idea to dip the probe in vegetable oil. Doesn’t evaporate, doesn’t freeze, and it has better thermal variation qualities than less viscous fluids. I’ll have to give that a try. The only issue I see with this temp controller is with Celsius, you can set the resolution to +/- 0.3 degrees, whereas with Fahrenheit, you can only set it to +/- 1 degree (page 10 of http://www.ink-bird.com/asset/file/ITC-1000%20Manual%20-%20V1.2.pdf). I like to keep my fermentation temperature as tight as possible, so I’d still use Celsius just for the tighter temp range. Can you confirm if this is actually the case? Hey Steve, Great question. I haven’t done my build out yet, so I can’t tell you one way or the other. I will say that I’ve owned multiple digital temp controllers (including a brewbit model t with .1 deg F resolution) and have never concerned myself with tenths of degrees. Even .3 degrees C = about .5 deg F. I think it’s great that you want more precision, but for me… I’m happy with 1 deg F. Having said that, maybe someone else can chime in on the ITC-1000 and if not, I can certainly let you know when I finish my build.